In a part of East Belfast, near where I spent my childhood, an avenue which is known worldwide to legions of ‘Vanatics’, was the venue this week for a fantastic celebration of a superstar’s 70th birthday. 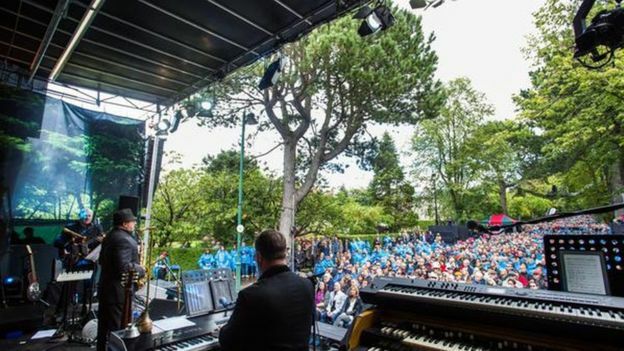 Fans had come from all over the world to see and hear the legendary Van Morrison in Cyprus Avenue, the tree-lined location he made famous nearly 50 years earlier in a song of the same name, in the now very collectable 1968 ‘Astral Weeks’ album. In spite of a drop of rain, which, after all, has been well-mentioned in much of his music – including the line ‘When it’s not always raining there’ll be days like this’ – the crowded avenue roared its approval to, perhaps, Belfast’s greatest songwriter, by singing ‘Happy Birthday’. Well done, Van, from one in the old neighbourhood.